Did you know that every year 300,000 people require hospital treatment because their attempts at garden DIY have gone wrong? Many of these injuries are down to electrical equipment – in fact, a third of all gardeners say that they’ve had some sort of electrical accident while doing work outdoors. UK charity Electrical Safety First is currently running a ‘Get smart in the garden’ campaign to try and get lawn mower and hedge trimmer manufacturers to improve the safety advice they provide to customers in order to prevent more of these accidents from occurring. But what can you do yourself to avoid injuring yourself or your family when you’re working in the garden? Here are a few easy-to-follow tips to help you stay safe when it comes to doing a spot of garden DIY. An RCD protects against electric shocks and fires by automatically cutting the electricity supply if a fault is detected (for example, if you accidently cut through a mower of trimmer cable – the biggest cause of electrical garden accidents). Any socket where you plan to plug in gardening equipment or power tools should have RCD protection; it’s usually a relatively inexpensive job to get one fitted and, since it’s not an exaggeration to say that it could save your life, it’s definitely worth the small investment. Remember that RCDs should also be tested every three months to make sure they’re still in good working order. 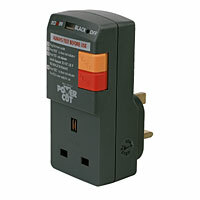 Read more about Circuit breakers and Fuses in DIY Doctor Projects section. Extension leads, cables and connections that you plan to use in the garden should be weather-resistant with moulded connections so moisture can’t seep in; when it comes to using them, make sure all cables are fully uncoiled to stop them from overheating. You should buy your electrical equipment and tools from a reputable manufacturer, read all the instructions carefully before use and always switch off and unplug before attempting to adjust or clean them. You should also regularly check all electrical garden equipment for any damage and be sure to keep it dry at all times. Any amount of water and electricity is a potentially dangerous combination. Whether it’s pouring down with rain or there’s just a bit of dew on the grass, stay well away until conditions have dried out. If you’d like to hang on to all of your toes, sandals are a no-no during garden DIY, and you should always wear gloves and goggles when using a hedge trimmer. See a range of suitable personal protection equipment in the DIY Superstore. Garden pond pumps should be installed properly according to manufacturer’s instructions, protected by an RCD, and kept in good working order throughout their lifespan to prevent injury (to you or your fish…). Any mains supply garden lighting should be installed by a registered electrician and in accord with BS 7671 – Requirements for Electrical Installations (IEE Wiring Regulations). You should give your outdoor lights a regular check to ensure they’re kept clean and are free from damage. To read more advice about how to get smart when it comes to using electricity in the garden, visit the Electrical Safety First website and see all their safety campaigns.